The Barbie Dream House has been delighting girls in various forms for over 45 years. From a relatively simple first design to the more elaborate modern version, Barbie's homes have reflected the decor of the times when they were produced. Barbie's first home offered to children to play with was introduced to the market in 1960. A thoroughly modern Barbie called a studio apartment home at that time. It was made out of cardboard and folded up in between play sessions. The apartment was equipped with a twin bed, a couch, and a coffee table. A stereo, makeup table, and a closet completed the home. The floor was portrayed in a tile pattern and the brightly colored walls made this product attractive to young girls. By 1974, Barbie had moved up into a two-story dwelling. Now she had a total of six rooms and the house came with an elevator so that Barbie could move from one floor to the other with ease. By today's standards, this version of the Barbie Dream House is pretty basic. The "rooms" consist of a floor with a colored backdrop to create the different themes. Barbie's home included a kitchen, bathroom, living room, and bedroom. Barbie even had a hot tub!The end of the decade saw Barbie's house improve so that it was a three-dimensional house. This version was a two-story A-frame home. It even had skylights and flower boxes for added detail. Barbie had fully embraced outdoor living by 1984. The plastic house has two stories, but no exterior walls. Barbie has a patio table and chairs and a Bar-B-Q at her house. Her bed is even placed outdoors in this version. The 2008 Dream House is recommended for children between the ages of 3-8. The toy requires six batteries to operate: three alkaline AA batteries and three AG13 Button Cells. Amazon.com offers the Dream House for sale. Be sure to check how long processing the order will take and consider that fact when calculating how long it will take to arrive on your doorstep before you place your order. You will also need to factor in shipping costs when you decide whether it's worthwhile to place an order online. Toys"R" Us offers this product with free shipping in some cases. Visitors to the site can add this item to their baby registry or wish list as well. Visitors to the NexTag.com web site can see a number of online stores that offer this product. Customers can browse through the lists and compare prices very quickly. They can click through to be taken directly to the store offering the item at the price they want to pay with ease. 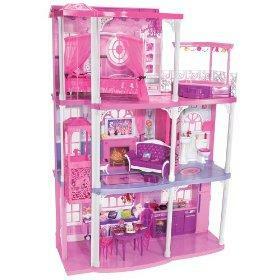 Barbie's homes have evolved over time and the Dream House will provide hours of enjoyment to children who receive one.